This I wrote the night I drafted this poem, mid-March this year, as a caption to a photo. My town was having a crawl of businesses, plus there was a major conference ceramics exhibit and other exhibits too. Unusually warm for this winter I enjoyed my walk and spent some time in the coffeehouse. I filled a plate with snacks and went to the counter by the window where flyers and newspapers gathered, and a box that said “free poetry” with napkins and paper and pens to write them with, and at least a dozen poems in the bottom of the box. On the side was painted, “I have measured out my life with coffee spoons,” a quote from T.S. Eliot’s The Love Song of J. Alfred Prufrock, hence the reference in my comment above. I’d had a poem rumbling around in my thoughts, and as I enjoyed the evening of galleries and friends I was wandering by myself and decided I’d make a creative night of it. When I walked into the coffeehouse I remembered the poetry box and knew I could and should spend time drafting the poem that was trying to be formed. I had seen this actual place in the days just before that night, driven down the alley noted in the text, and the title, or something very much like it, appeared in my thoughts as if on a marquee, some of the lines scrolling through my thoughts like a ticker on the television. Yes, this is autobiographical, and I honor and learn from writers who can write of their own experiences, painful or otherwise; I truly enjoy learning about them, from themselves. But myself, I’m not sure I want strangers knowing that much about me. Or even people I know. But the stories are good, and this image came to me in a well of memory filled with a fair amount of sadness for the pain of that time. Still, I remembered that moment of anticipation and knew I had to write about it. At the counter in the coffeehouse I drafted the poem, went to see the two exhibits upstairs and downstairs there, had some more snacks and gave it a rewrite, took a digital photo of it and dropped it in the box. Parts of this final poem are very much changed from that draft, parts are verbatim the little scrolling phrases that came to mind first thing. 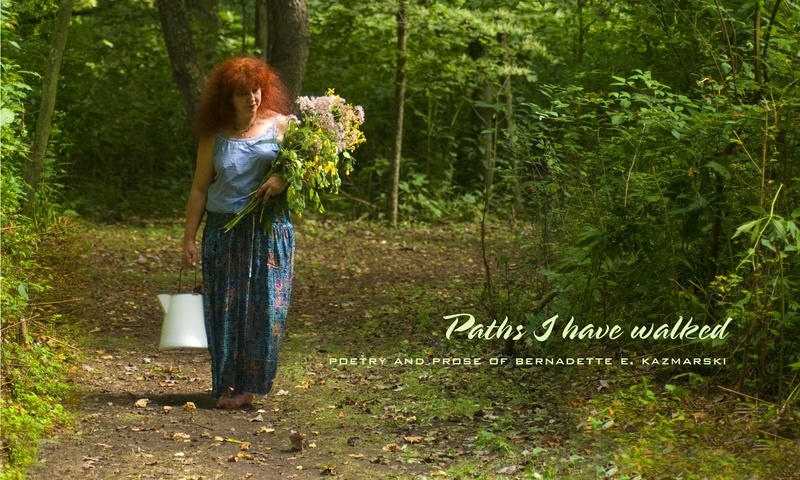 Poem “When I Saw the Place We Once Lived” by Bernadette E. Kazmarski © 2007, may not be reproduced in any way without express written permission of the author. Links to this blog are fine. 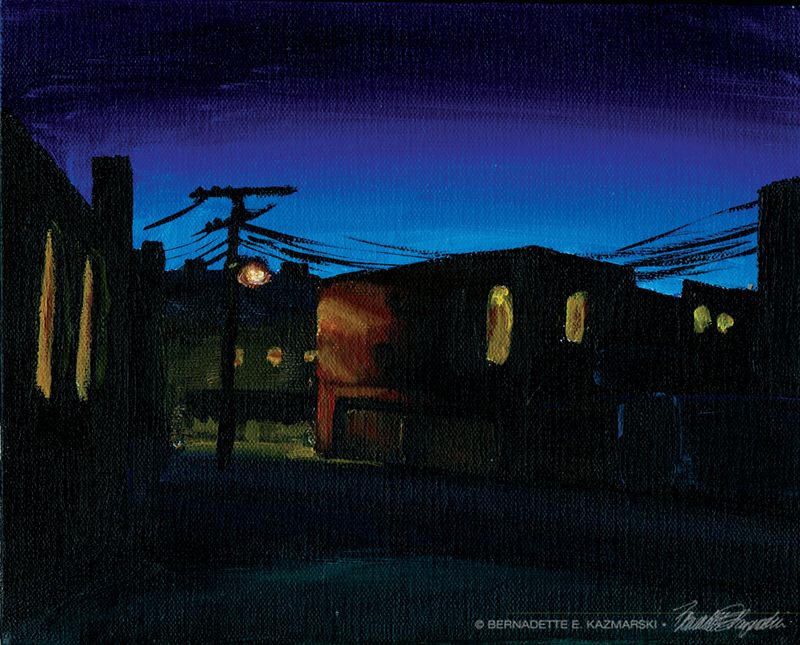 The painting used to illustrate this poem is “Alley in Dusk”, an 8 x 10 acrylic painting from 2008. I felt it caught the summer dusk, and the sense of an alley, and waiting in the dark for an action.